Join Corridor Gallery in welcoming the remarkable talent and imagination of Chris Mac Donald; found object artisan, sculptor and inventor. SCULPTURE24 will showcase a delicious array of works which demonstrate Chris’ reverence for the sculpture found in everyday life, a desire to play and reinvent, a sense of elation and wonder found through the process of arduous craft and a limitless imagination. Chris Mac Donald explores the life-cycle of objects and the stories they tell through the process of sculpture. Working in a wide range of materials from wood craft to metal work Chris breathes vital new life into each eccentric piece; reimagining obsolete remnants, creating new compositions which showcase the beauty of everyday things, old relics and discarded technology. * The lifeblood of Chris Mac Donald’s work is the seamless transition between making, craft and display; offering the viewer an essential insight into how sculpture enriches any space, with particular thought for interacting with sculpture in a home setting. SCULPTURE24 will combine characteristically playful sculpture in an eye-catching display; including a space which Chris can inhabit at various intervals during the show creating an direct link between the maker, the viewer and the work. Chris Mac Donald’s infectious passion for his craft and engaging sense of humour are sure to generate stories, laughter – offering a personal guide through the mechanicals elements of the works on show; allowing the viewer to re-imagine each piece, creating a memorable and inspirational experience. Chris Mac Donald’s sculpture is well-known in Brighton, despite the wide range of his works a distinctive style and anarchic sense of humour remain constants in every piece and gather much affection and loyalty from his fans and collectors. Chris has enjoyed many happy decades finding joyful inspiration from living in Brighton, he previously ran the Acme Gallery (now Gallery 40) in the heart of the North Laines. Chris continues to regularly exhibit his unique and playful sculptures in various independent galleries in Brighton, with intermittent shows in London and Europe. 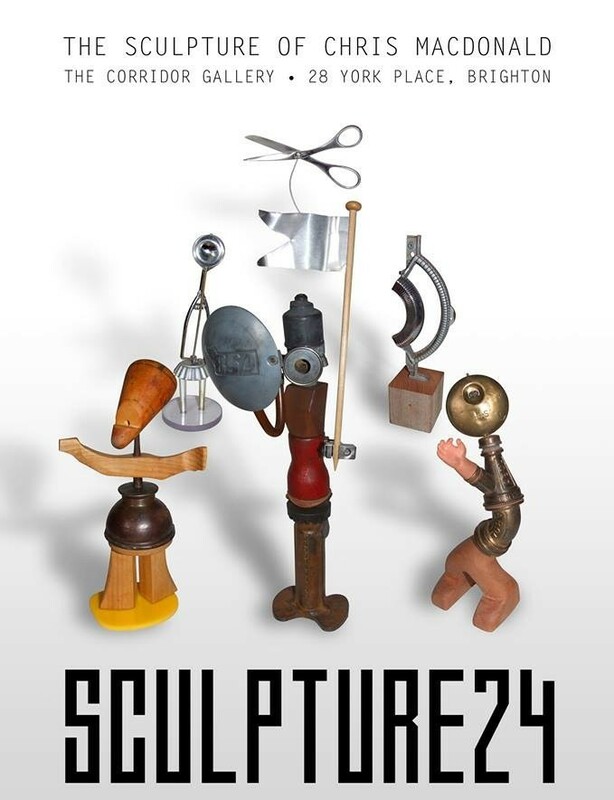 Corridor Gallery is delighted to house SCULPTURE24; creating a relaxed and easy environment, ideal for appreciating the playful and tactile elements which Chris Mac Donald has vivaciously fused into every sculpture. This entry was posted on October 28, 2015 by mptask in Brighton, Corridor Gallery, November 2015 and tagged art, art exhibition, Brighotn, Chris MacDonald, Corridor Gallery, sculpture, sculpture exhibition.